Some very exciting news is that a world-class DXpedition is planned to embark from Cape Town in 2016. 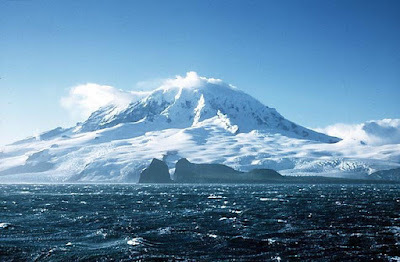 The DXpedition is a major scientific / communications expedition to Heard Island, an Australian sub-Antarctic island lying at 53°S 73°E. The location is very isolated and subject to extreme weather conditions. Consequently, it is infrequently visited - it was last activated as a DX entity 19 years ago in 1997 where a station was set up at Atlas Cove. Paul Johnson / ZS1S, (and recent DXpeditioner to Tristan da Cunha as ZD9ZS), has joined the South African Support Team as Team Leader. 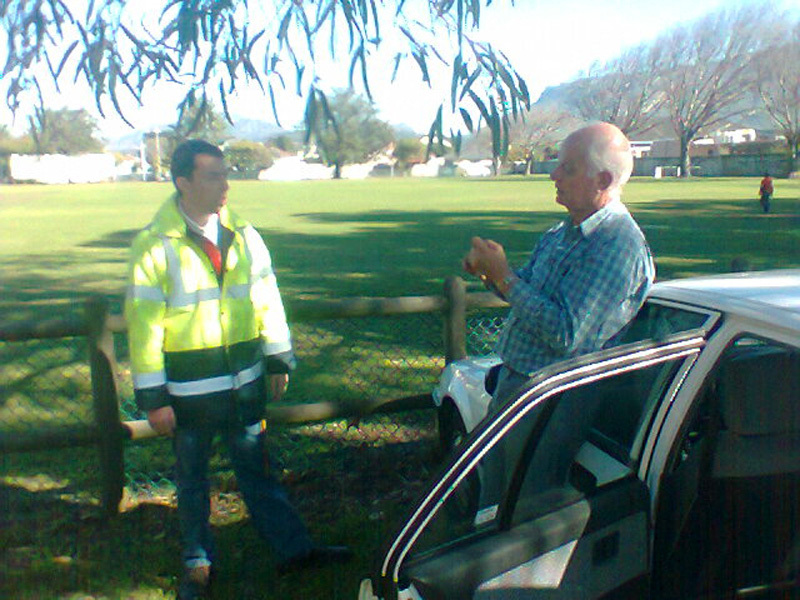 Paul also will add friends and members of the local Cape Town ham radio clubs (including the Cape Town Amateur Radio Centre), and Paul’s good friend and fellow DX-er Dennis Wells / ZS1AU. Paul and Dennis join Pierre / ZS1HF (ex ZS8M) and Mal / ZS6MAL on this key critical support team. The Heard Island 2016 DXpedition, consisting of top DX operators, will embark from Cape Town on the m/v "Braveheart", usually based in Wellington NZ. This vessel has already featured in other DXpeditions as well. The voyage is scheduled for March 6 – April 20, 2016, with the amateur radio operation taking place on about March 16 – April 8. The group hopes to make as many as 150 000 contacts with 50 000 possible radio ham stations worldwide during the DXpedition. The official callsign will be VK0EK. The official website is here.You can subscribe to the VK0EK newsletter here. Wideband, Narrowband, what is this all about and what does it mean to us? Why are the committees of both CTARC and Oakdale opposed to a move to FM narrowband deviation at this time? Firstly, a bit of background: There are 8 possible frequencies for 2 metre FM repeaters on our current wideband scheme; 145.600, 145.625, 145.650, 145.675, 145.700, 145.725, 145.750 and 145.775 MHz. If you listen around on 2 metres you will note that most of the time all of the local repeaters sit silent or perhaps one is in use. During rush hour sometimes you may find 2 or 3 repeaters being used, but not often. Right away you can see that we are very fortunate to have so many possible repeater channels to use and we hardly make use of most of them. Some of our repeaters go for several days without any usage. Now, what is the purpose of the narrowband concept? There are several technical reasons not to go to narrowband, including the reduction in range in weak signal conditions. The only technical reason to move to narrowband is so that you can fit twice as many repeater channels into the existing space. Instead of 8 possible repeaters you could have 16 repeaters. Some European and a very few American cities with large and active ham populations have moved to narrowband to gain the extra channels and, for them, the move to narrowband is both necessary and sensible. In this area you hear every week, the Western Cape Repeater Working Group (WCRWG) who maintain our repeaters are continually looking for funds to maintain our existing repeaters. Neither CTARC or Oakdale clubs can see a purpose in installing another 8 repeaters, even if we had the funds to purchase, license and maintain them. Proponents of the move to narrowband point to the fact that turning down the deviation level on older equipment (the type most of us still use) will make it compatible with narrowband. This does make the transmitter compatible but not the receiver which will now pick up the new repeaters installed on either side of the channel you are using. And if they are not going to be installing repeaters on either side of the existing ones, then why are we moving to narrowband in the first place? The Oakdale and CTARC Committees believe there is more to this unnecessary move to narrowband than meets the eye. Time will tell. Additional confusion also exists around ICASA rulings. ICASA has decreed that VHF stations move to narrowband as there are more Commercial stations than there are frequencies available. This ruling makes sense for Commercial repeaters which are what the ruling was aimed at. I wish we still had our old type of radio inspectors who understood the difference between Amateur and Commercial operations and regulated them accordingly. ICASA does not allocate what modes and channels we are to use on our 2 metre band. In fact if you check in the regulations, Annexure I which details the Amateur frequencies you will see that the law simply states that we can operate from 144 to 146 MHz all modes except Pulse or Fast Scan Television. That’s all the law says. The old Radio Inspectors knew that Amateurs were a self-regulating group that could sort themselves out as we have historically done. The only repeater in our area that is still on wideband and therefore usable with all past and current production equipment is our 145.750 repeater. This is ably maintained by our Dave Perry ZS1SG. If you have older equipment that does not switch the transmitter and receiver between wide and narrow you will appreciate the insistence that ourselves and Oakdale have taken to keep 145.750 on wideband until there is a valid reason to need to change it to narrowband. A debate on QRZ.com about Narrow-vs-Wideband FM [here]. A technical article about Narrow-vs-Wideband FM [here]. A Frequently Asked Questions page [here]. 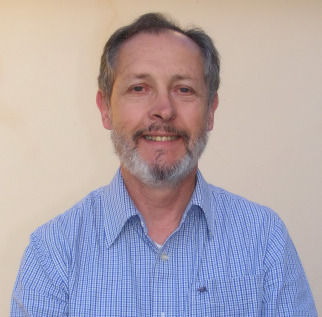 However, owing to the extended nature of the May 2015 meeting where Johan Marais / ZS1JM gave feedback from SARL Council, the June meeting will be a presentation by Nick / ZS1ZD on the interesting new PowerWall and PowerCube batteries recently announced by Mr Elon Musk in the USA, and their implications for electricity consumers in general and radio amateurs in particular. 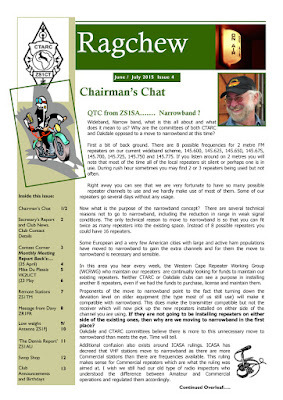 There will be a committee meeting on Monday, 22 June at 19h00 at the CTARC Clubhouse. Please diarise accordingly. 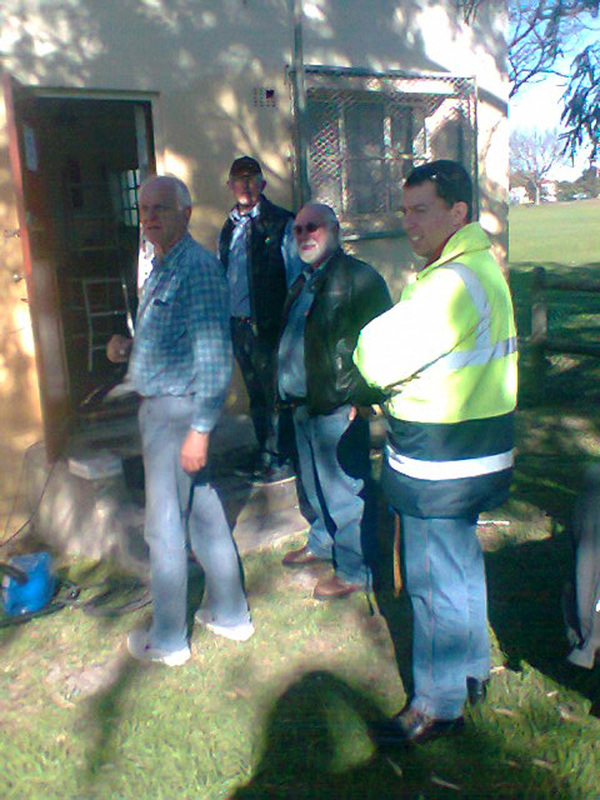 At 10h00 on Saturday 20 June 2015, members of our club met to start on Noel /ZS1FW's plans for rationalisation and maintenance of equipment at the Cape Town Amateur Radio Centre. 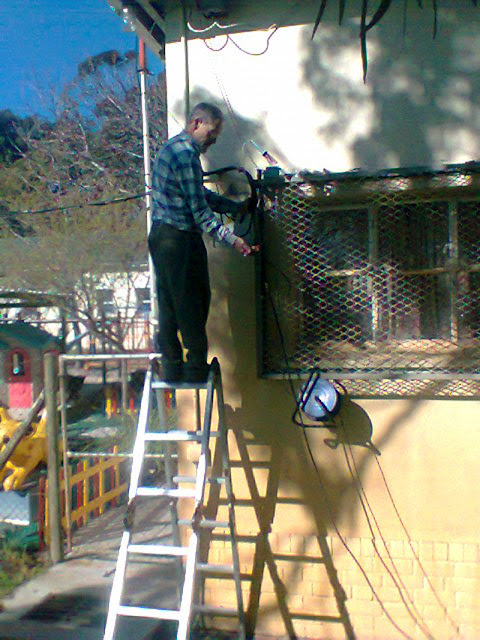 The weather was fine and clear, which made it possible to work safely on the antenna feedlines while up on a ladder outside, a task shouldered mostly by Paul / ZS1S, assisted by Danny / ZS1BL and Noel. Inside the clubhouse, Rob / ZS1SA, Hylton / ZS1HPC and Nick / ZS1ZD started going through the vast pile of documents and files that stretch back into the dim mists of time. The plan here is to remove unnecessary paper yet also to retain those items of historical interest. Decisions are being made w.r.t. antennas and other equipment in need of maintenance and repair, a process which will continue at the following work party. We are also deciding what to do with the pictures (both framed and unframed) on the one side wall above the operating position. We will also be sorting through the lockable store room area that its space be used more effectively. Also present were Barry / ZS1FJ, Tony / ZS1TK, Richard / ZS1RIC and Ian / ZS1OSK. Grateful thanks to all who pitched up to assist. We will be doing further antenna maintenance work on Saturday 1 August, starting at 10h00. 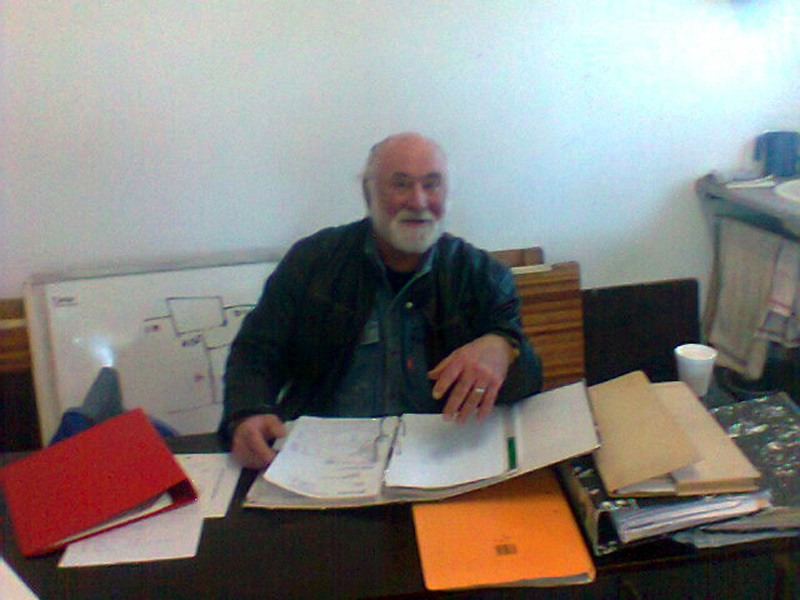 Rob / ZS1SA goes through reams and reams of old club records, "weeding" judiciously! 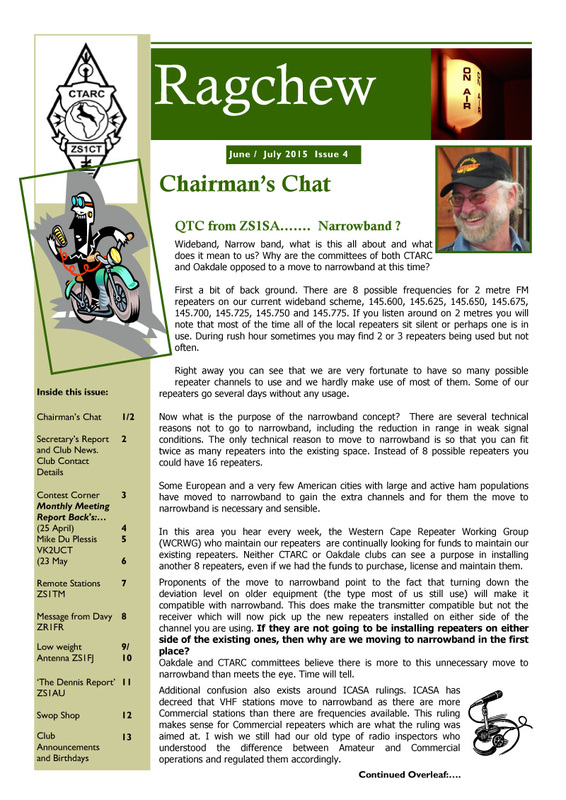 The June / July 2015 edition of the Cape Town Amateur Radio Centre's bi-monthly newsletter "Ragchew" has been published. Members of the Cape Town Amateur Radio Centre are encouraged to attend a weekend Work Party to be held at the clubhouse on Saturday, 20 June 2015. • Tidy up excess Co-Axial Feedline and waterproof outside connectors. • Repair the "Force 12" Antenna (Centre of boom). • Check all the remaining Antennas and decide what to do with them. • Get rid of all surplus 2m (and other odd) Antennas in the storeroom. • Check out Main Antennas. • Get rid of all excess equipment etc. • Fix Cupboards (broken doors) and tidy up the operating area. • Decide what to do with the Picture Gallery on the main wall. • Decide what Rotators to keep and what to dispose of. • Go through papers adjacent to door (Do we need the Cupboard?). • Keep the back area of Clubhouse (adjacent to door) tidy, get rid of junk. While not all of the above will be possible to complete at that Work Party, the aim is to complete it in the next two months. 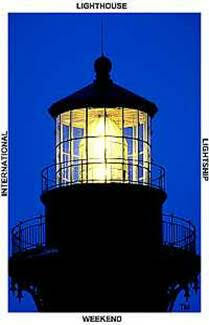 The dates have been announced for the annual International Lighthouse and Lightship weekend. They are Saturday August 15th and Sunday August 16th 2015. At this long-established event, various ham radio clubs around the country (and the world) operate from lighthouses and lightships. Cape Town Amateur Radio Centre will certainly be setting up a station this year, as always, at the Mouille Point lighthouse on the western seaboard of Cape Town. We will require the assistance of members to load the equipment at the clubhouse in Rondebosch, transport it across to Mouille Point, assemble the station there (all on Saturday morning), operate the station throughout the 24 hour period, then take down the station and antennas on Sunday afternoon, transport it back to Rondebosch and repack it in the clubhouse. Still two months ahead, but please diarise August 15 and 16 in your diaries!